Description: The 1136 leads the "POL-EX" today. The coaches decorated are 913, 914, 910, 764, 766. Cab car was 1510. Read the Album Notes for a description. Description: Boston-bound 1010 from Middleboro sits with GP40MC 1136 idling in Braintree. Description: 223 heads into Melrose Highlands. Description: Outbound commuter heading towards Haverhill. Description: GP40MC 1136 idles in Braintree after arriving with inbound 1036. Description: GP40MC 1136 screeches into South Weymouth with 039 bound for Kingston. Description: 1136 pulls 039 out of South Weymouth. Description: 36's at rest side by side. 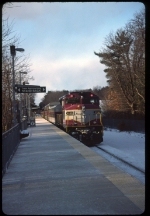 Description: Inbound commuter train running wrong hand main in Ayer, MA. Description: I go all the way to PA and shoot something I can shoot 2 miles from my house. A pair of GP40MC units are at Juniata for overhaul.